The Tigers salvaged an 8-5 season with a record-setting 63-14 Music City Bowl victory over Purdue giving Auburn faithful something positive to hold onto heading into the 2019 season. They signed their QB of the future, 5-star Bo Nix, and finished No. 11 in the nation in the 2019 recruiting cycle. Bowl victories and strong recruiting are important for momentum and where head coach Gus Malzahn is concerned also beneficial in turning down the heat a degree or two on his seat. That’s the good news, Auburn showed definite signs of life in routing the Boilermakers and proved that they aren’t that far off from competing again in the SEC West. Certainly, that’s not to say that there are still major objectives that must be met if Malzahn is to continue leading the football program. Here are 5 realistic goals that the Tigers could accomplish heading into spring ball and the 2019 season. This is first and foremost on the list. Auburn has talented signal-callers though unproven at the college level. All eyes will be on incoming freshman Bo Nix, the 5-star dual-threat from Pinson Valley, Ala. Malik Willis will be a junior but has only thrown 14 passes in limited action over the past two seasons, completing 12 of those for 69 yards and a touchdown (no interceptions). Redshirt freshmen Cord Sandberg and Joey Gatewood will also compete for the job. Malzahn might still be looking. He was interested in Jalen Hurts and the transfer portal includes options at the most important position. Malzahn went back to calling plays in the Music City Bowl and wow what a difference. Records went flying out the window as Auburn executed Malzahn’s orders to near perfection in a 49-point victory. If that can carry over into the 2019 season, and granted a couple of those key pieces won’t be back (QB Jarrett Stidham, WR Darius Slayton), then the Tigers can return to the offensive juggernaut that propelled them to the SEC Championship Games in 2013 and 2017. 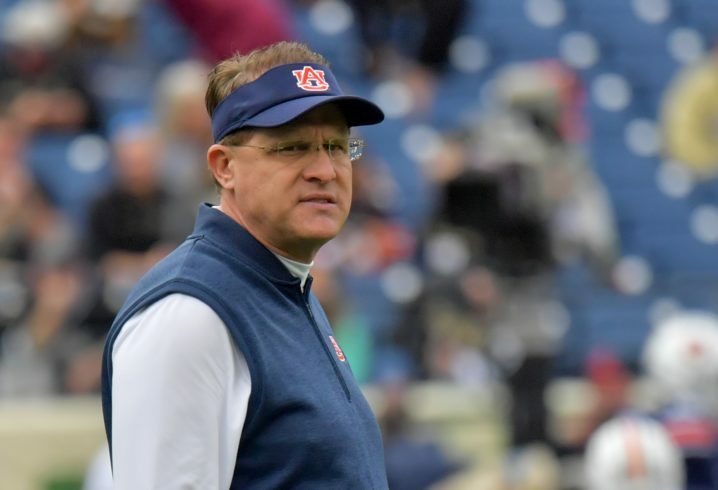 Malzahn hired Kenny Dillingham as offensive coordinator, but make no mistake: This is Malzahn’s show in 2019, and we’ll begin to see that as soon as this spring. Auburn’s most coveted recruit could make an immediate impact. The 5-star from Grayson, Ga., enrolled early and has been bonding with teammates. The 6-0, 210-pounder is the nation’s top player at his position, according to 247Sports.com, and the third overall talent in his class out of the state of Georgia. Pappoe will no doubt get ample opportunity to earn a starting role in Auburn’s biggest position need outside of quarterback. Auburn’s incoming class isn’t huge, but it added some significant pieces on Signing Day: Charles Moore and Mark-Anthony Richards. Moore, a 6-4, 268-pound defensive end decommitted from Mississippi State and flipped to Auburn. The 4-star from Louisville, Miss., is an Under Armour All-American. Richards also is a 4-star and a Top 100 prospect. He is listed as an athlete, but most expect him to join the Tigers’ loaded backfield rotation. Landing those two helped offset losing George Pickens to Georgia and also kept the Tigers close to the Top 10. They finished No. 11, but that was 1 spot ahead of last year. This is probably a big ask, but if the Tigers are going to compete in the SEC West, it is a must. Three of Auburn’s four starting linebackers are seniors and will need to be replaced for the 2019 season. Sophomore Nick Coe is the only returning starter, and only sophomores and freshmen are left on the depth chart. Outside of developing a quarterback for 2019, this will be Malzahn’s biggest task this offseason. But there’s talent to work with, and the addition of Pappoe should help as well. Sophomores K.J. Britt and Big Kat Bryant displayed some talent throughout the season as did fellow sophomores T.D. Moultry and Chandler Wooten. Freshmen Richard Jibunor and Zakoby McClain also saw playing time. Develop a QB. That’s funny. Doesn’t happen under Gus. To some extent going against a talented SEC roster and not having experience facing Malzahn’s unique offense contributed to the lopsided results against Purdue. I don’t mean to take away anything from Auburn’s great offensive showing in the Music City Bowl, but just adding that some extenuating circumstances, in addition to Malzahn’s resumption of play calling, may have contributed to the outcome. Malzahn hasn’t shown the ability to coach a high school player into an SEC caliber QB since he first came to Auburn. Bo Nix is taking a huge gamble that he will be the first one. The kid seems to have the potential, but that was also said of every other freshman QB under Gus. Considering how most of these kids are already running basically the same offense in HS, it’s been amazing how none have worked out under Malzahn. What highly rated QB has Gus ever signed that hasn’t worked out? Gatewood was always going to be a project and may still work out. Johnson was a low 4*. He might or might not ever be able to develop a QB, but it’s not like he’s ever had a kid as talented as Nix to start with. Malzahn has signed multiple highly rated 4-star HS QB’s. Which one has done anything? None have even been effective starters. That’s why Malzahn’s always looking for a transfer with experience. Name one other than Gatewood. The fact is, he has settled for his #3 or #4 QB in every recruiting cycle. That’s the biggest reason he’s had to look for transfers. So you have a QB for 2 years. He throws 14 passes in those 2 years. Why wait till the start of his 3rd year to develop him. It seems that all Gus needed to do is develop all his players to their full potential in order to win. Wow, that is not how the rest of the coaches win. Thanks for the insider info. And how many passes has Mac Jones attempted over the last two years?